1. Include a clear, direct subject line. 2. 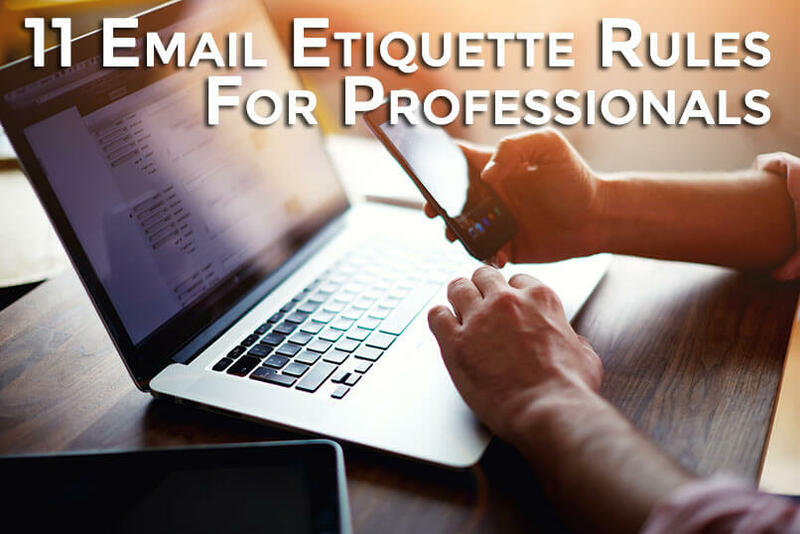 Use a professional email address. If you work for a company, you should use your company email address. But if you use a personal email account — whether you are self-employed or just like using it occasionally for work-related correspondences — you should be careful when choosing that address, Pachter says. You should always have an email address that conveys your name so that the recipient knows exactly who is sending the email. Never use email addresses (perhaps remnants of your grade-school days) that are not appropriate for use in the workplace, such as “babygirl@…” or “beerlover@…” — no matter how much you love a cold brew. No one wants to read emails from 20 people that have nothing to do with them. Ignoring the emails can be difficult, with many people getting notifications of new messages on their smartphones or distracting pop-up messages on their computer screens. Refrain from hitting “reply all” unless you really think everyone on the list needs to receive the email, Pachter says. 5. Use exclamation points sparingly. If you choose to use an exclamation point, use only one to convey excitement, Pachter says. 6. Be cautious with humor. Humor can easily get lost in translation without the right tone or facial expressions. In a professional exchange, it’s better to leave humor out of emails unless you know the recipient well. Also, something that you think is funny might not be funny to someone else. 7. Know that people from different cultures speak and write differently. Miscommunication can easily occur because of cultural differences, especially in the writing form when we can’t see one another’s body language. Tailor your message depending on the receiver’s cultural background or how well you know them. A good rule to keep in mind, Pachter says, is that high-context cultures (Japanese, Arab, or Chinese) want to get to know you before doing business with you. Therefore, it may be common for business associates from these countries to be more personal in their writings. On the other hand, people from low-context cultures (German, American, or Scandinavian) prefer to get to the point very quickly. 8. Reply to your emails — even if the email wasn’t intended for you. It’s difficult to reply to every email message ever sent to you, but you should try to, Pachter says. This includes when the email was accidentally sent to you, especially if the sender is expecting a reply. A reply isn’t necessary but serves as good email etiquette, especially if this person works in the same company or industry as you. Your mistakes won’t go unnoticed by the recipients of your email. “And, depending upon the recipient, you may be judged for making them,” Pachter says. Don’t rely on spell-checkers. Read and re-read your email a few times, preferably aloud, before sending it off. 10. Add the email address last. 11. Double-check that you’ve selected the correct recipient.